Before the snow hit I was able to view some large patch symptoms in our breeding plots with our PhD student Manoj Chhetri. 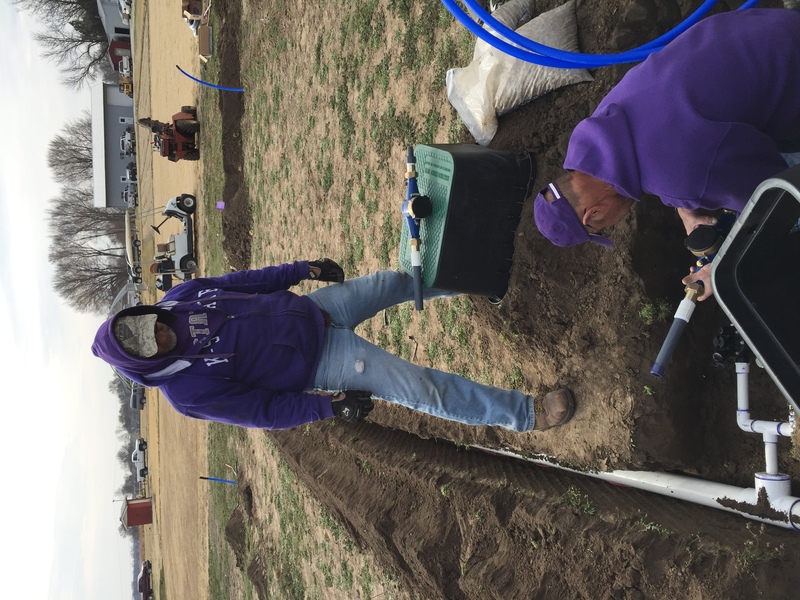 2018 K-State Turfgrass Research Reports Online! Every year the Kansas Agriculture Experiment Station publishes research reports on projects that are being conducted around the state. 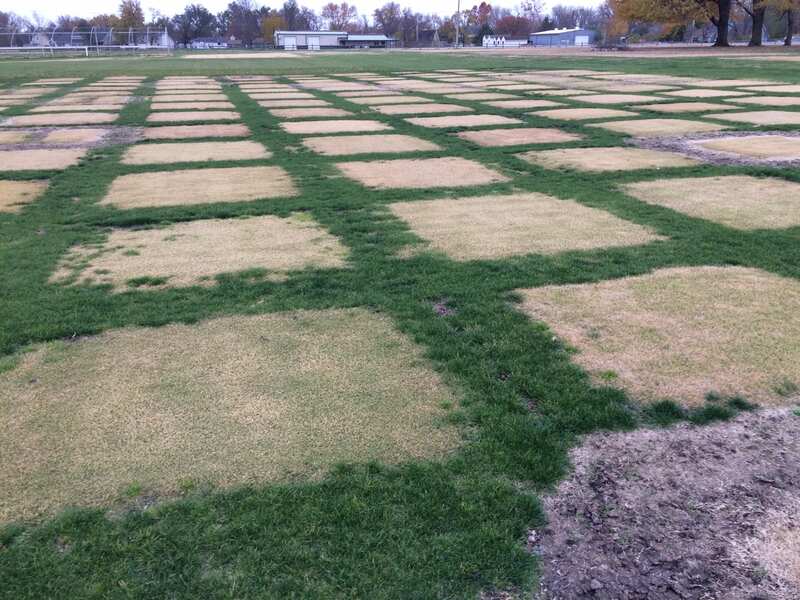 The 2018 Turfgrass Research Reports are now online! These reports contain everything from turfgrass variety testing, weed control, disease and insect management and more. Below are a list of the 2018 reports. Click the title to read more. 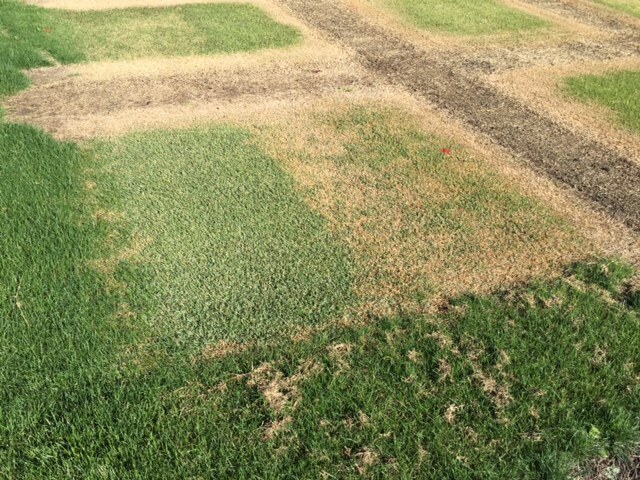 Cool, wet weather has triggered large patch activity in golf courses – and in our research plots. The photos below are from an ongoing research trial. You can read some details about the study in our online research update from spring. PhD student Mingying Xiang is the lead researcher on this study, under the mentorship of Megan Kennelly and Jack Fry. As you glance through the photos, you can clearly see the large patch on the inoculated sides of many of the plots, while the fungicide-treated side is clean. 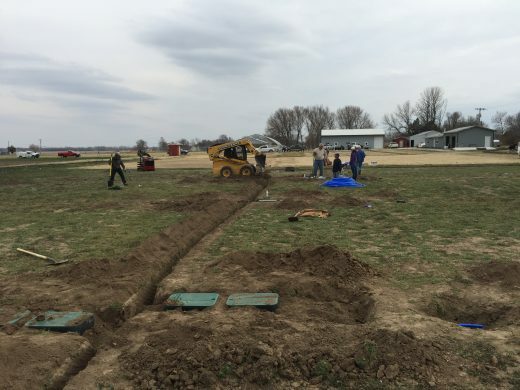 However, you will also see plots where you can’t even tell which side is which. 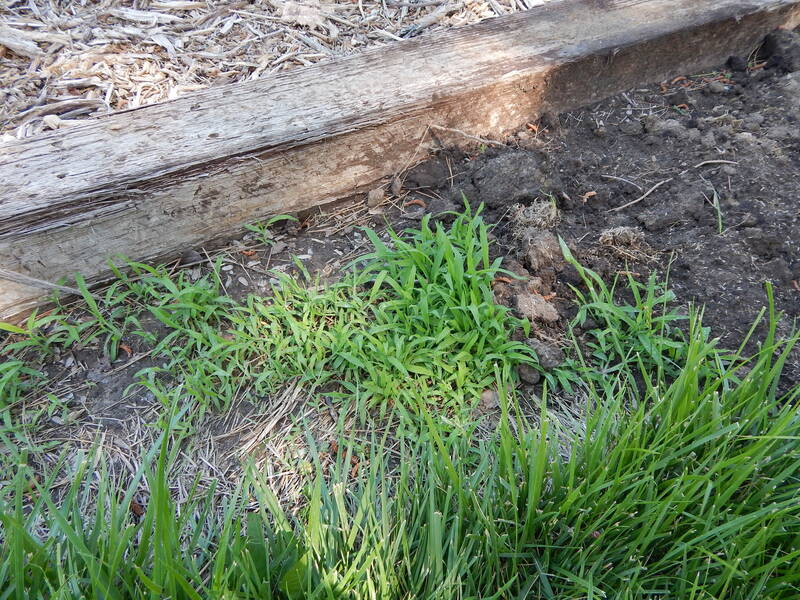 That is, even the inoculated, non-fungicide-treated side is looking clean. 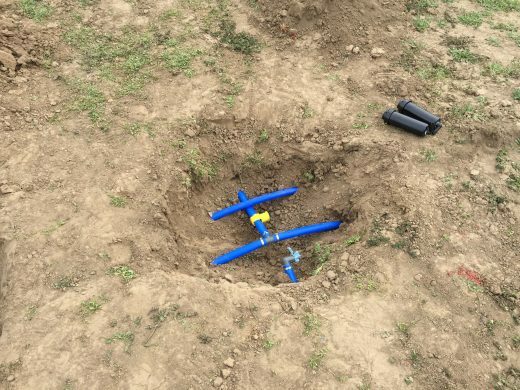 We are hoping those may be resistant lines to examine in further testing. Stay tuned! Turfgrass breeding takes a long time! 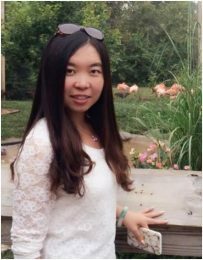 KSU PhD student Mingying Xiang is one of this year’s recipients of the prestigious Chris Stiegler Travel Award. 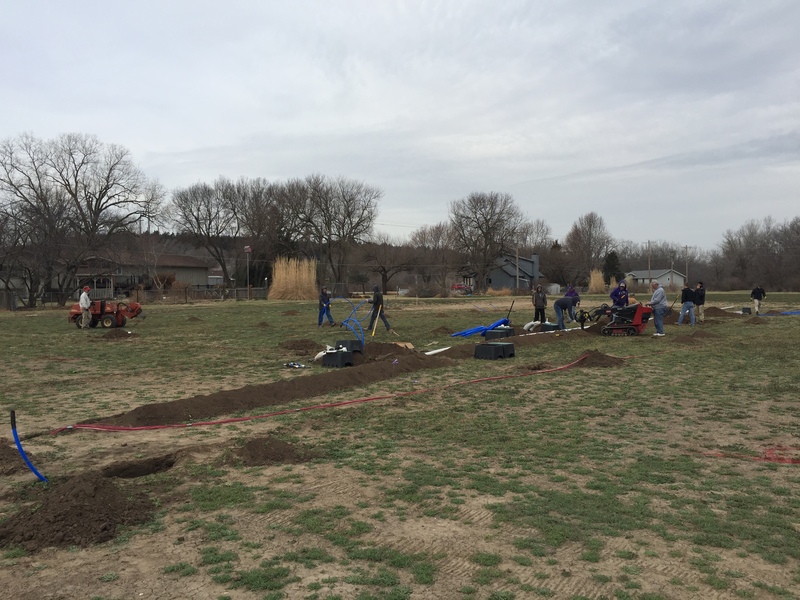 She will formally receive the award next week at the annual meeting of the Crop Science Society of America/American Society of Agronomy/Soil Science Society of America. Congratulations Mingying! She is recognized for her academic achievements in the classroom, research accomplishments, and leadership activities. 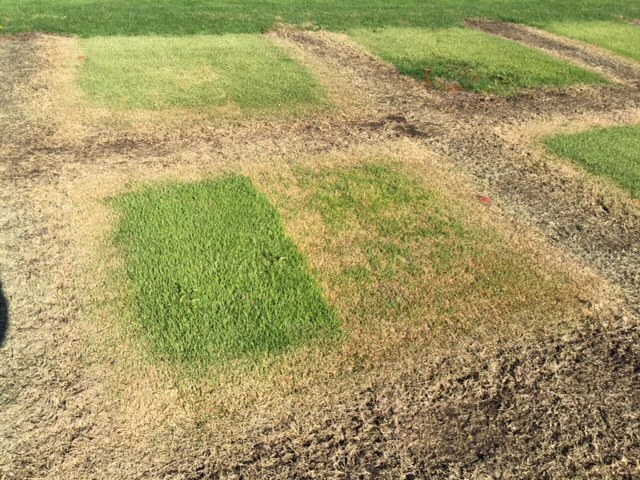 Mingying’s research is focused on evaluating zoysiagrass breeding lines for cold hardiness, quality, and resistance to the disease large patch along with studying the potential for tall fescue-zoysiagrass blends to reduce the disease brown patch while maintaining overall summer quality. 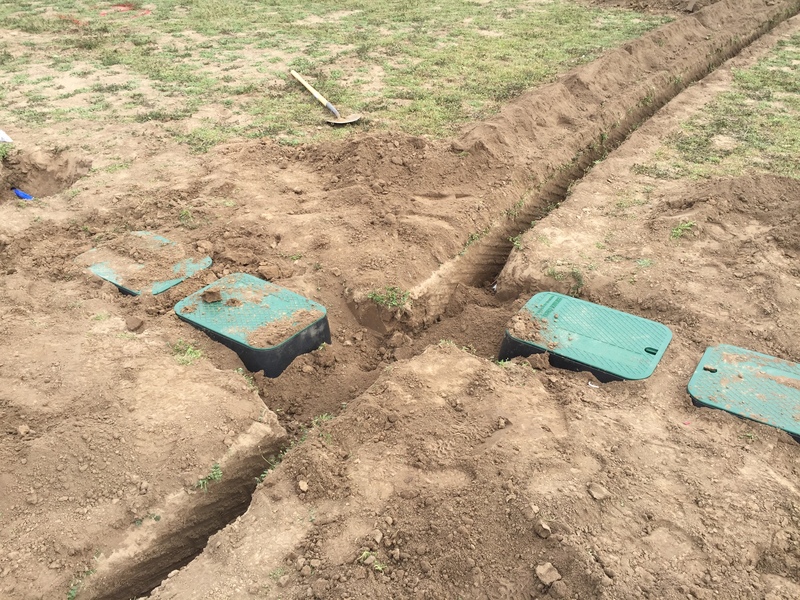 New Turfgrass Extension Publications Now Online!!!! 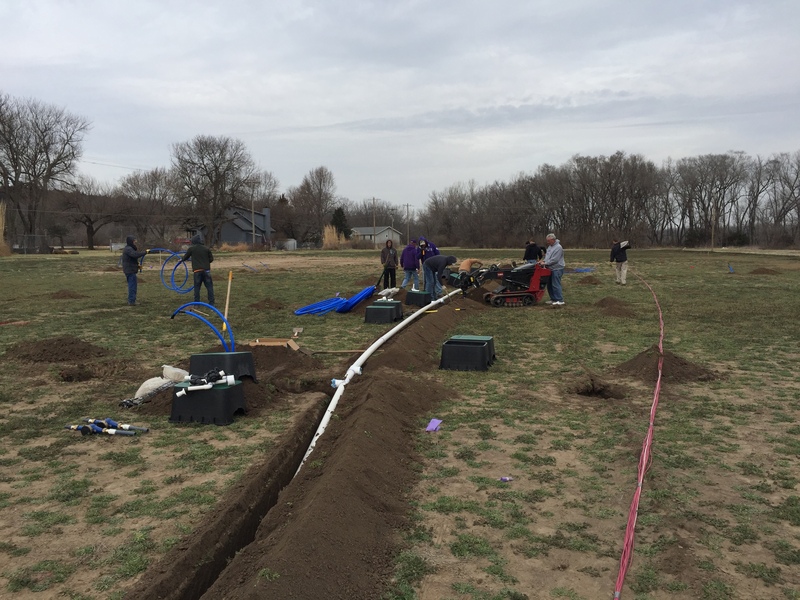 I have been busy this past year updating the KSU Turfgrass Research Extension Publications. 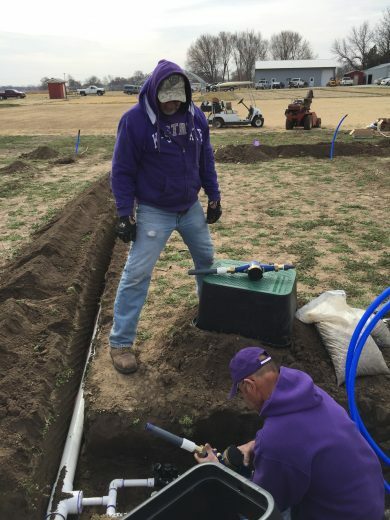 With the help of everyone at the K-State Research and Extension Bookstore we updated a total of 7. I wanted to share these with you so you have them to read and to share with your friends and neighbors. 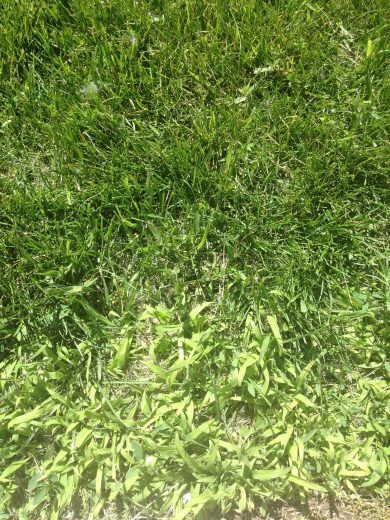 Benefits of a Healthy Lawn – Environmental, economic, health, and safety benefits of turfgrass found in lawns, athletic fields, parks, and roadsides. 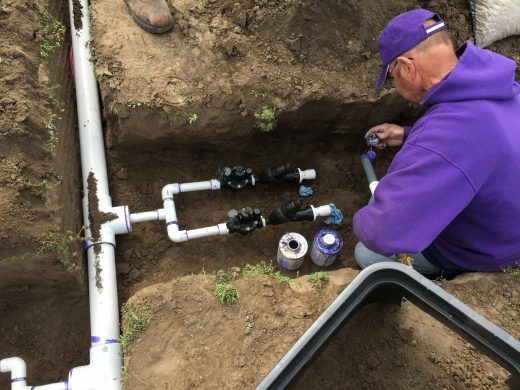 Turfgrass Selection – Professional Series – Information to help turfgrass managers select grasses appropriate for a particular environment. Lawn Fertilizing Guide – This guide helps homeowners determine how much fertilizer to apply to keep lawn vigorous and healthy. 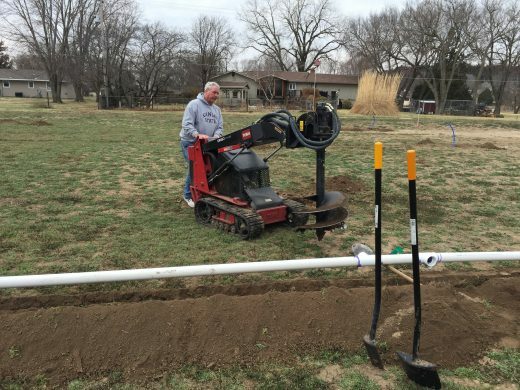 Turfgrass Mowing – Professional Series – Mowing basics for professional turfgrass managers. Information on mowing height and frequency, clippings, mowing pattern, mower operation, blade sharpening, mower selection, maintenance, and safety. Recycling Grass Clippings – Information for homeowners on why and how to recycle grass clippings. 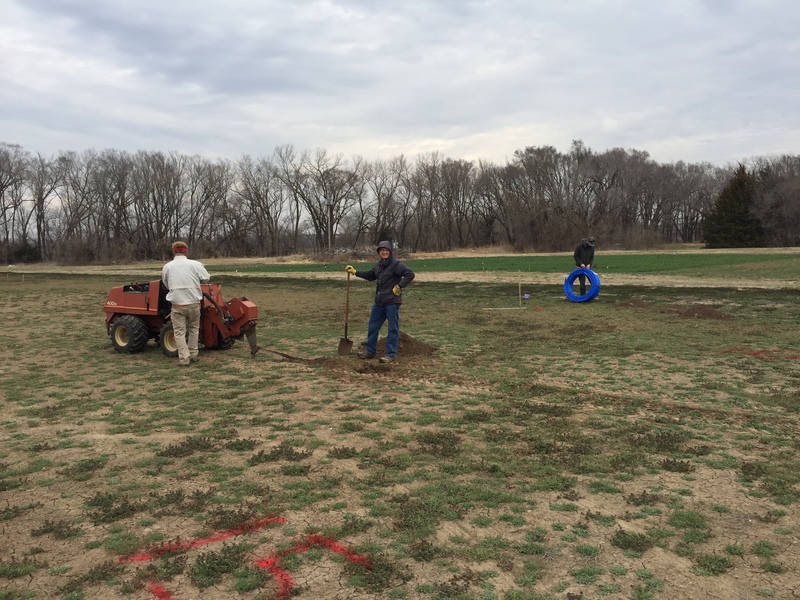 The 2017 Turfgrass Research Reports Now Online! 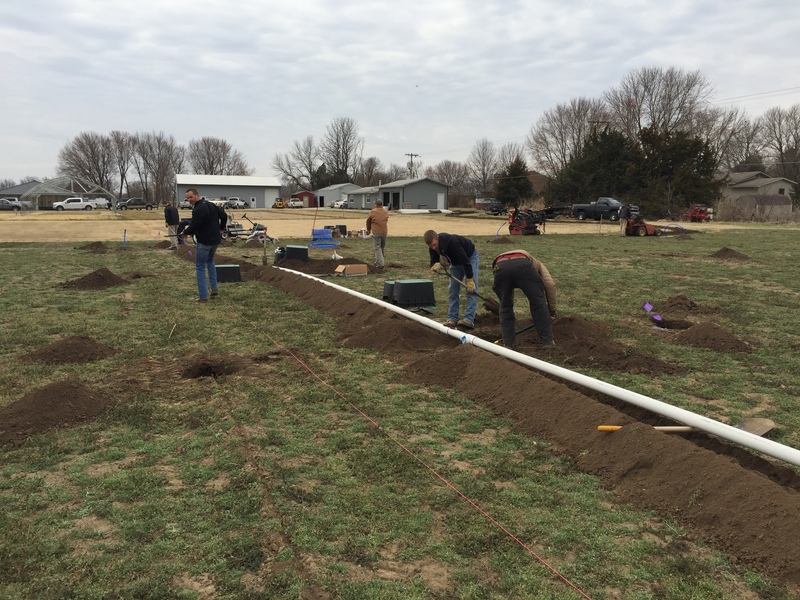 The 2017 Turfgrass Research Reports are now available!!!! See what research projects the KSU Turfgrass Team have been up to. 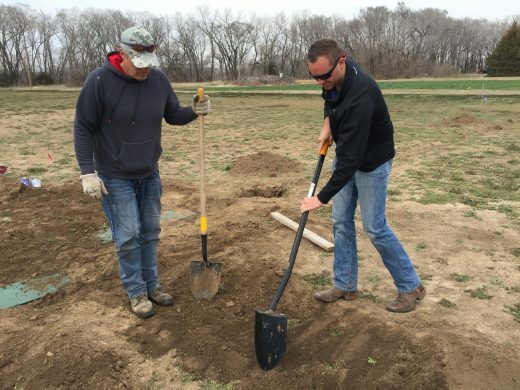 Click the link below to take you to the Kansas Agriculture Experiment Station Research Report Page. 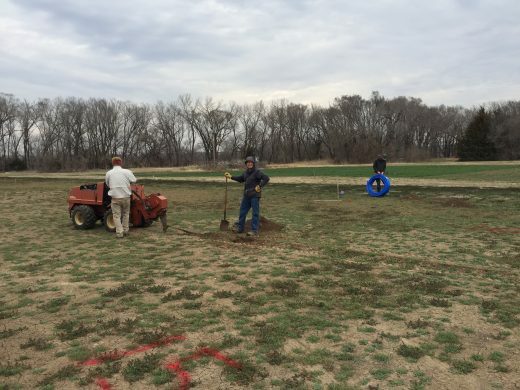 Kenton W. Peterson, D. Bremer, and J. M. Blonquist Jr.
Summary. 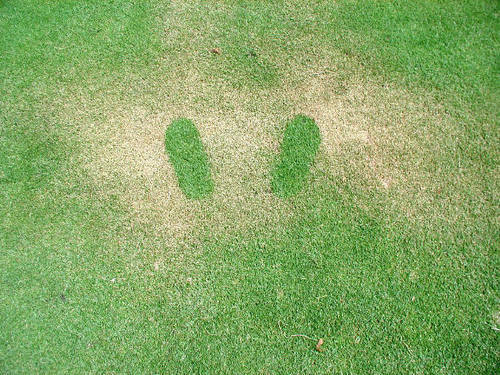 Turfgrass damage has been observed from misapplications of human insect repellents. Minimal research has been conducted to determine the cause of the damage. 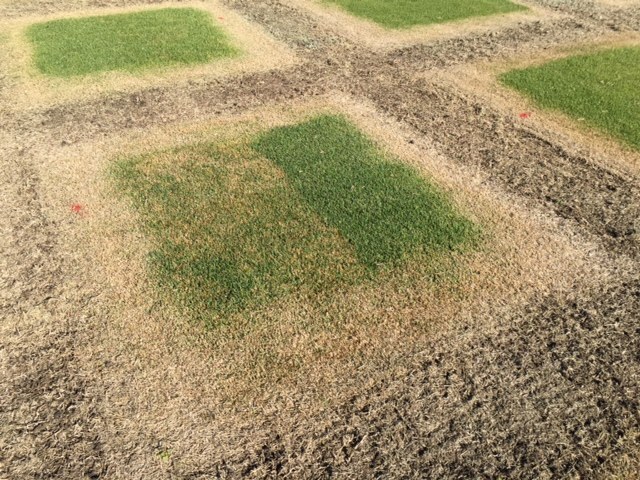 Greenhouse research trials were conducted to survey various human insect repellents on turfgrass growth and recovery. Insect repellents resulted in a wide range of damage. 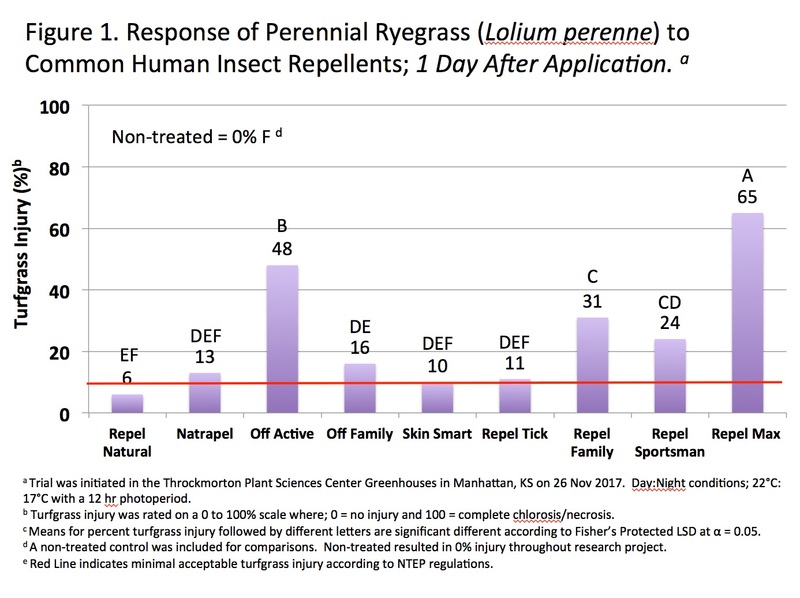 No common trend was observed although research trial shows possible repellents to be utilized around turfgrass that will minimize turfgrass injury. Rationale. Human insect repellents containing diethyltoluamide (DEET) commonly damage turfgrass due to non-target application. 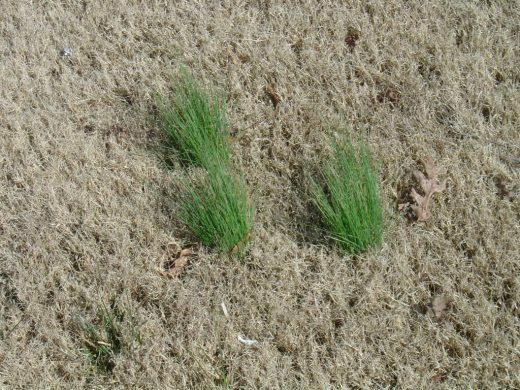 Common visual damage results in two areas of healthy growing turfgrass in the shape of footprints with necrotic and chlorotic turfgrass surrounding. 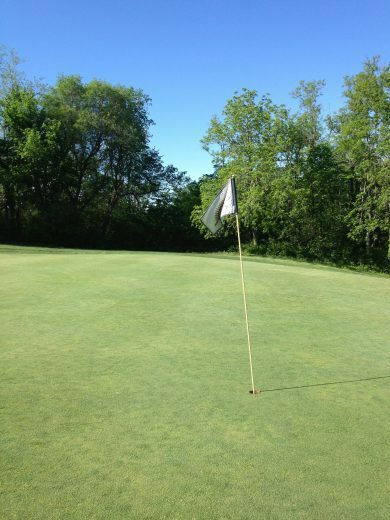 Damage results in unacceptable turfgrass quality and playability. 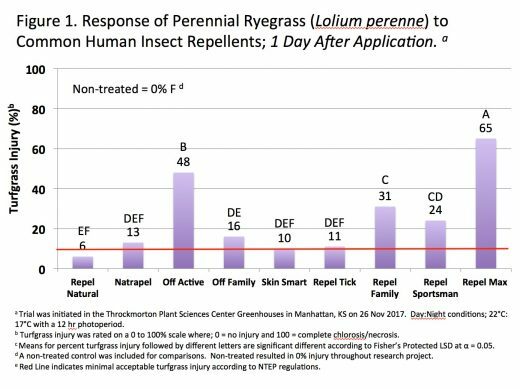 Minimal research has been conducted to explore the influence of human insect repellents on turfgrass injury and recovery. 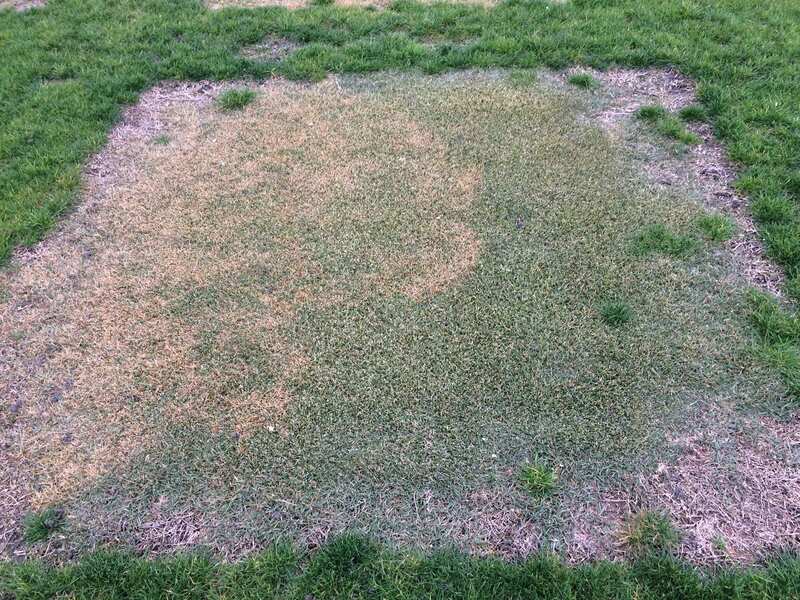 Damage from bug spray misapplication to turfgrass. Objectives. 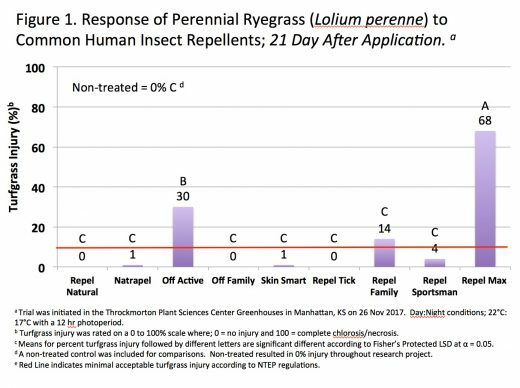 Evaluate the influence of human insect repellants on Perennial Ryegrass (Lolium perenne) growth and recovery. Study Description. 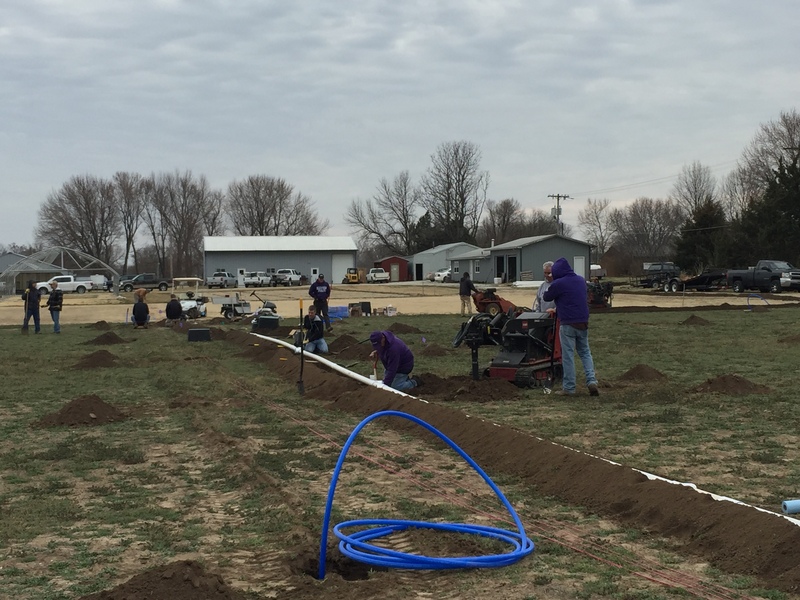 Research trials were initiated in November of 2016 at the Throckmorton Plant Sciences Center Greenhouses in Manhattan, KS to determine the influence of human insect repellents on perennial ryegrass (Lolium perenne) growth and recovery. 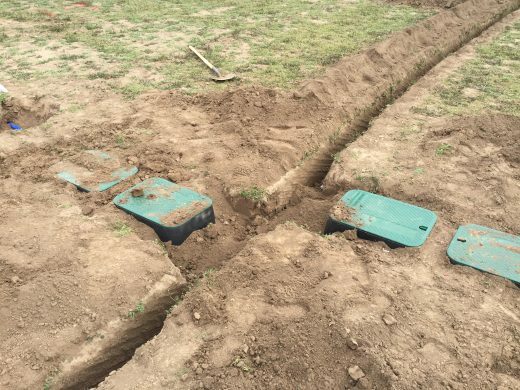 Perennial ryegrass was established in 10 by 10 cm pots at 387 kg ha-1, maintained at 4.4 cm and were irrigated to prevent drought stress. Greenhouse environment was a 12 hr photoperiod at 15.5°C/ 22.2°C (night/day). 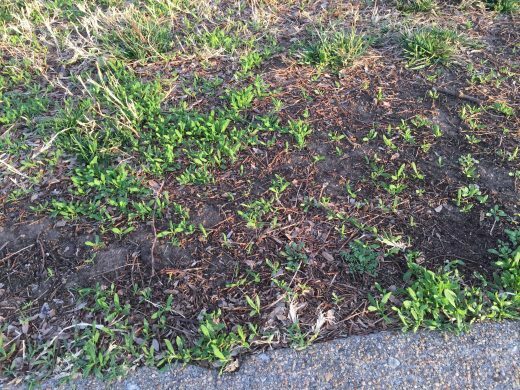 Insect repellent treatments were applied to perennial ryegrass plants arranged in a randomized complete block design with 4 replications. 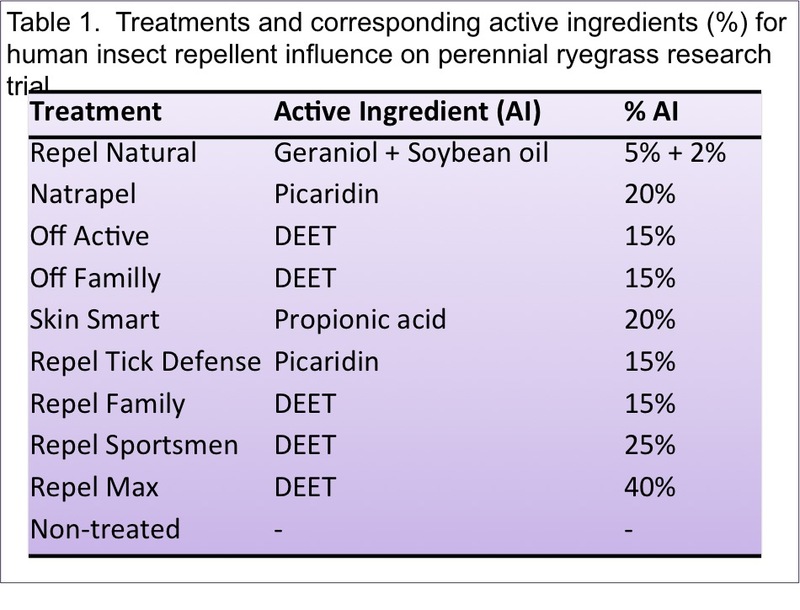 Treatments included 9 insect repellents and a non-treated control for comparison (Table 1). Five treatments contained the active ingredient DEET. Other commonly used insect repellents were also included for comparison. Collected data included visual percent injury on a 0%- 100% scale, where 10% represented maximum acceptable injury. Data was subjected to ANOVA in SAS and means were separated according to Fisher’s protected LSD at 0.05 significance level. Results. All treatments except the control resulted in at least 6% turfgrass injury 1 day after application (DAA). Repel Max (40% DEET) and Off Active (15% DEET) resulted in 68% and 30% injury, respectively 21 DAA. 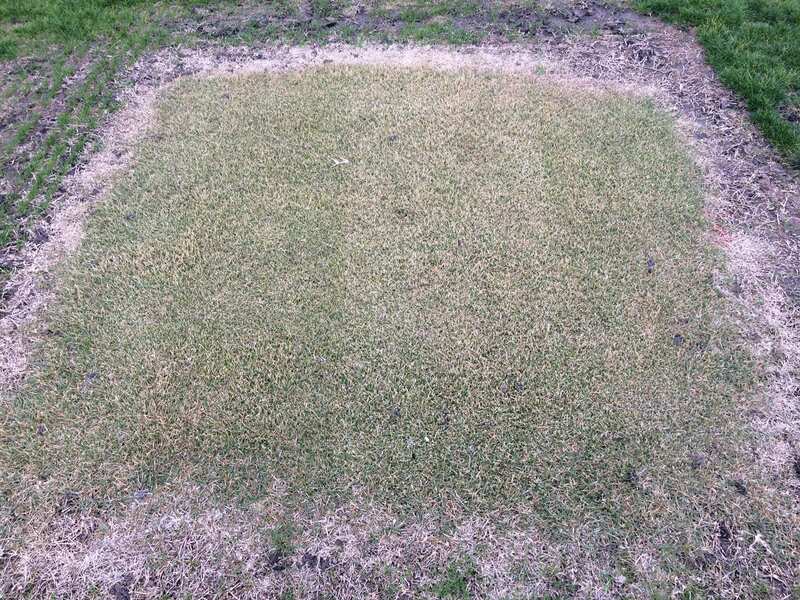 At 21 DAA all other treatments resulted in turfgrass injury similar to the non-treated. 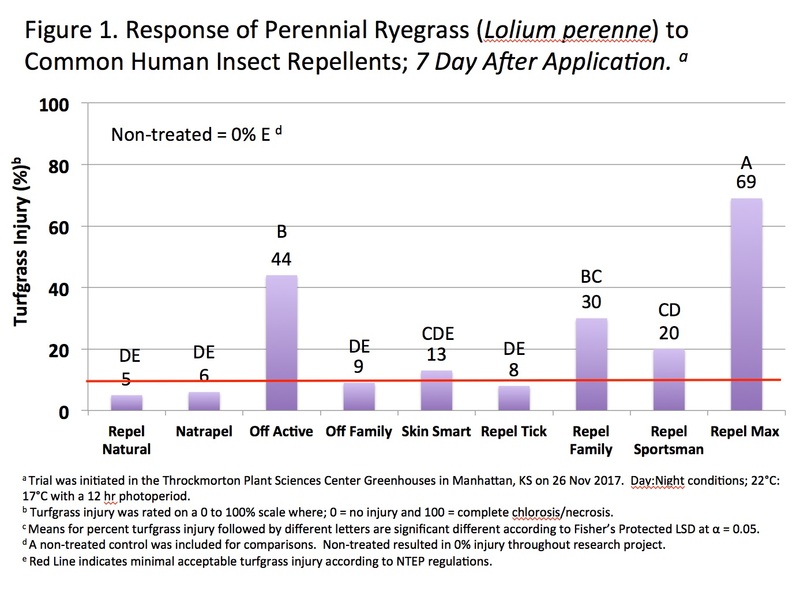 Insect repellants with the same active ingredient percentage resulted in various perennial ryegrass injury and recovery. Although no different in % DEET, Off Active and Off Family resulted in 30% and 0% injury, 21 DAA, respectively. 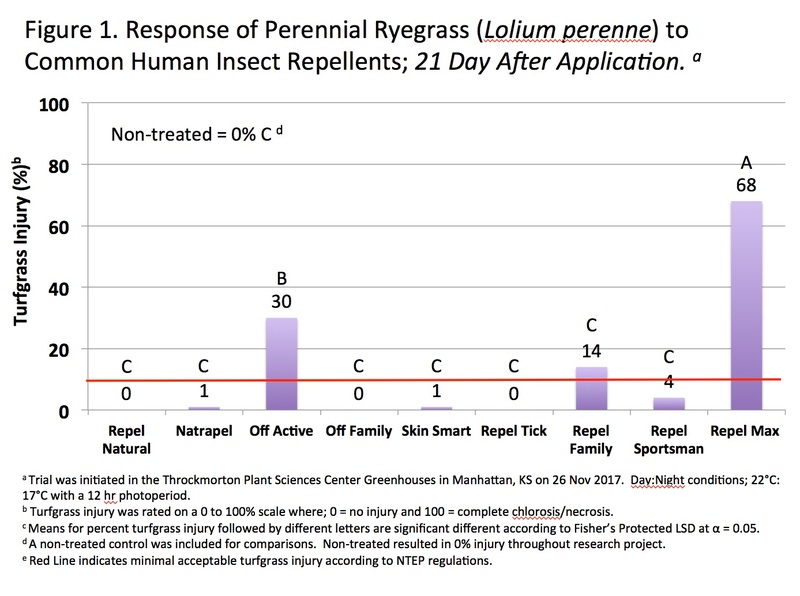 Results also demonstrate that permanent non-target turfgrass injury could occur if Off Active and Repel Max are applied as a human insect repellent. 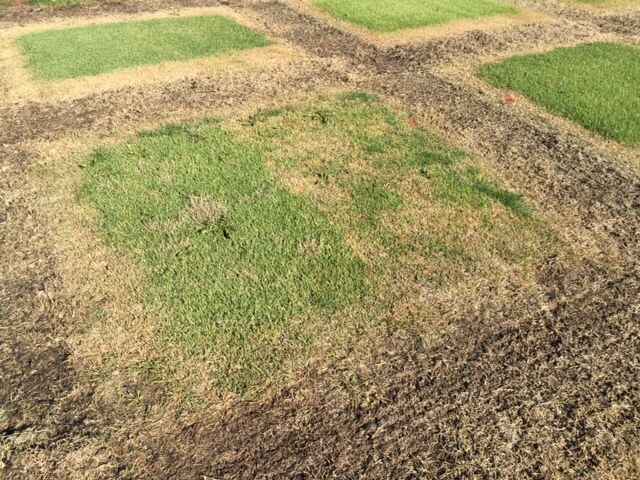 Further greenhouse and field trials are needed to confirm results as well as determine if other non-labeled ingredients influence turfgrass injury.